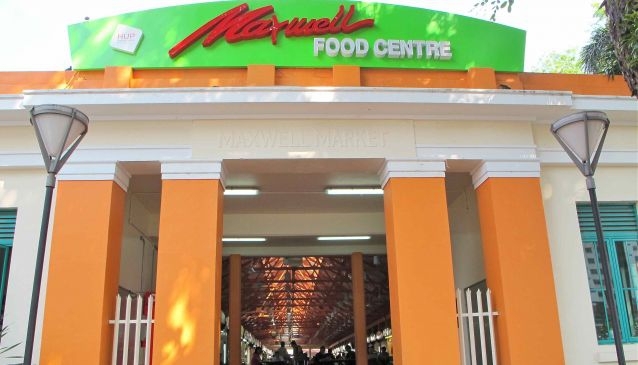 Maxwell Food Centre is ideally combined when visiting China Town and the hip area around Club Street and Duxton Hill. Located just opposite of the beautiful Buddha Tooth Relic Temple, it is known for its unique Chinese dishes seldom found in other hawker centres. Formerly the wet market of the China Town residents in the 1950s, the centre later became a popular place to go for traditional Chinese delicacies. It was renovated in 2001 and is popular with the business crowd from the nearby Central Business District. With over 100 stalls there is plenty of choice and with that much competition among the food stalls, the quality and taste of the food offered is excellent. Maxwell Food Centre is known for its Fish Head Bee Hoon, Chicken Rice and Tapioca Cake. Below is a list of the most popular stalls at this hawker center with their unit number. You might encounter waiting times for up to 30 minutes during lunch and dinner times. Make sure to pass by Stall Nr. 64 China Street Fritters which has been run by the same family for over 60 years. Voted among the 20 Top Vendors by Singapore Favourite Food 2013 they serve delicious Ngoh Hiang, a plate with liver fritters, egg cake, fish balls, century duck eggs, and sausages. Everything is still home made with high quality ingredients using a traditional family owned recipe.